Wales' head of performance Dr Ryland Morgans has left the role amid reports new manager Ryan Giggs wants a fresh face in the role. Morgans was part of former boss Chris Coleman's backroom team at Euro 2016. Manchester United head of athletic development Tony Strudwick has been linked with the role. On social media Morgan said his eight years in the role had been "an honour and privilege" to work with Wales' "best players". He also praised a "fantastic group of staff" and said reaching the Euro 2016 semi-finals was "the highlight". Morgans had combined his Wales role with working at Crystal Palace until leaving the club side in September, 2017. Coleman had wanted Morgans and psychologist Ian Mitchell to have full-time Football Association of Wales contracts if he was to stay on as national team manager. Goalkeeping coach Tony Roberts will stay in that role, but Giggs has yet to appoint the bulk of his backroom staff. Giggs hopes to appoint Dutchman Albert Stuivenberg as part of his coaching team. 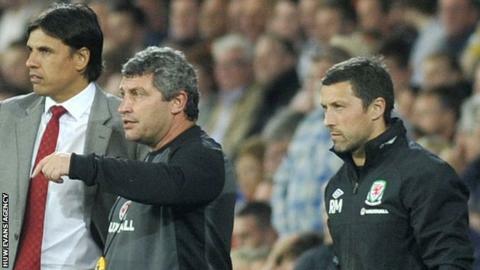 Coleman's former assistant Osian Roberts is among the candidates to be in the new set-up. Where should Wales play home games under Giggs? Read more on Ryan Giggs: Which stadium should he choose as Wales' home?